A night after baffling Braves hitters and in his 17th major league season, 415 career starts later, and on the cusp of becoming the pitcher with the most starts in Boston Red Sox club history, Tim Wakefield if finally getting his due. 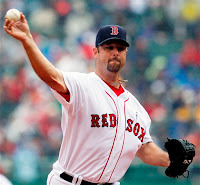 Months prior to his 43rd birthday and Tim Wakefield has notched his major league leading 10th victory. More victories than teammate Josh Beckett, Mets ace Johan Santana, and three more wins than any pitcher in the Bronx. His Red Sox are leading the American League in wins, and yes Tim Wakefield is just as much a reason as anything else that they are. As far as this season goes, Wakefield has been nothing short of dominant. Now this Red Sox knuckleballer is never going to have an earned run average south of 3.00, in fact he has only done so in three seasons of his 17-year career, but Wake has potential to baffle hitters on almost any night. In 2009, Wakefield has allowed 3 or fewer runs in 9 of his 15 starts. To go even further, his Boston Red Sox have only lost 3 games in the same 15 that Wake has taken the mound. Victories against the Mets, Yankees, Tigers, and Rays, all teams Boston could see in the postseason. While Red Sox aces Jon Lester and Josh Beckett got off to somewhat of a slow start before turning it around as of late, and the obvious struggles of Daisuke Matsuzaka, it was Tim Wakefield who has carried the Red Sox rotation through much of the first half and continues to hold his own. Over his long career Tim Wakefield has seen it all. From the 2003 ALCS in which he allowed that infamous Aaron Boone homerun that ended both the Red Sox season and the career of Grady Little in Boston to the breaking of said curse just 11 months later. Tim Wakefield has been part of a rotation that has included such stars as Roger Clemens, Pedro Martinez, Curt Schilling, and currently ace Josh Beckett. Wakefield has been left off playoff rosters, been moved to the bullpen, and never a complaint. Never a contract dispute that I can remember, never a "C" stapled to his jersey, never a steroid rumour (knock on wood), and unfortunately never an All-Star appearance, until this season. Red Sox fans have watched the likes of Garciaparra, Nixon, Vaughn, Ramirez, Pedro, and Boggs all leave in the same time that Tim Wakefield has been stepping over the white lines. Through 382 starts with the Boston Red Sox and 11 seasons of double-digit victories, Tim Wakefield has been a staple of the Boston Red Sox. He's been part of teams that couldn't get out of their own way and he's been part of teams that ran through everything in their way. When American League All-Star manager and current Rays manager, Joe Maddon, fills out his roster and adds Tim Wakefield to that roster it'll be the tribute which Wake has always deserved. Upon Tim Wakefield's most recent 1-0 victory over the Atlanta Braves and tying a club record for games started, Tim Wakefield had this to say, "It’s pretty cool to win a 1-0 game. I’ve been on the opposite end of those quite a bit. Kind of nice to be on the right side." Nuff said.